The Neag School of Education, the UConn Department of English, and the Connecticut Writing Project (CWP) at UConn are proud to announce Connecticut’s winners of the 25th annual Letters About Literature competition, a nationwide contest sponsored by the Library of Congress for students in grades 4 through 12. 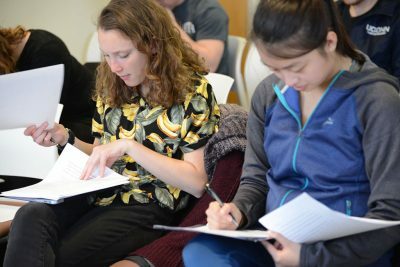 This fall, the Neag School, the Department of English, and the CWP served as the contest’s Connecticut sponsors for the 2017-18 academic year; Neag Professor Doug Kaufman, CWP Director Jason Courtmanche, and Neag School Ph.D. candidate Dani King-Watkins served as the contest’s representatives for the state of Connecticut. There were more than 1,300 submissions from Connecticut students, and 120 finalists. Each finalist will receive a certificate of recognition. Nine winners from each of the contest’s three categories (Grades 4-6, Grades 7-8, and Grades 9-12) have been selected, and each will receive a cash prize and state recognition, which includes a special ceremony at the Connecticut State Capitol Building on Friday, April 20. From those nine winners, three first-place winners have been selected, who will now advance to the national competition, for which winners will be chosen later this month. Read more about the contest here, and click the students’ names below to read their winning essays. Check out photos from the Letters About Literature judging day.